We welcome you to our charming self-contained Yurt, attached to our family home, set on 2 1/2 acres of lovely bush. For a relaxing retreat enjoy our beautiful valley, pool and yoga studio, 5 min drive from Terrigal Beach and coastal national parks. A wonderful way to relax as a couple, indulge yourself in the midst of this beautiful nature, majestic trees and peaceful surroundings just 5 minutes from the renown Terrigal Beach. The wooden yurt has a large comfortable and bright room, thanks to the presence of four large windows overlooking beautiful trees and its central dome which allows you to watch the stars from your bed. A large terrace with a covered area that houses a fridge and a sink, a barbecue set, simple but really made to live in communion with nature. 80 kms north of Sydney, 5 minutes drive from Central Coast beaches and surfing spots. Our Yurt has its own private access with parking. 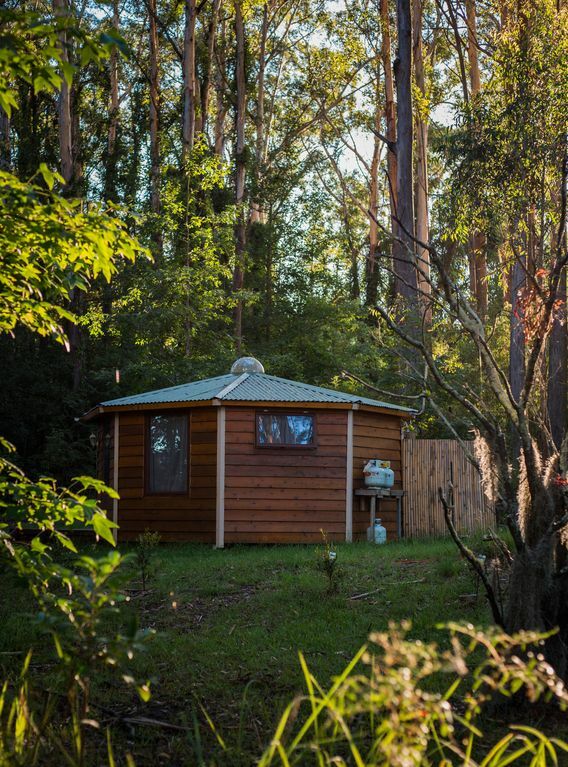 The Cabin sleeps up to 2 adults and opens directly onto a majestic eucalyptus forest. The property has a swimming pool and outdoor lounge area and comes with use of our Yoga studio. The newly built Yurt includes a small kitchen, outdoor hot shower, a queen size bed and a sofa and bathroom and a barbecue. The pool area and the yoga studio are shared with the family. As we have two Stayz listed properties on our land, we could accept a group of 6 people if you were interested to rent Funky Flat which has 25 Gold stars reviews. Please go to Stayz site, click on location Erina and click on Funky Flat on an Acreage. Both properties are on our land, 30m apart from each other. We are located in Erina Valley, one of the remaining semi-rural areas within minutes to Terrigal Beach. We are within walking distance of the best coffee on the coast Glee Coffee, as well as a fabulous Italian delicatessen BamVino, micro-brewery Six String Brewing co. and the famous Distillery Botanica and its award winning liqueurs. Our house is nestled in a lovely Eucalyptus forest and we wake up with the sound of many native birds (Sulphur Crested Cockatoos, Bell birds, King Parrots, Kookaburras and many more). If you love nature walks, our home is located 15min from breathtaking coastal walks and national parks. If you are a beach lover, the central coast offers a wide range of sandy beaches and tranquil bays for swimming and surfing. If you rather pamper yourself you can walk to Elyssian Beauty Skin therapy Centre or try a massage with Sana Wellness. There is public transport within walking distance, however, it would be much more flexible to have your own vehicle if you want to enjoy the coast. We'd love you to come and stay with us in our beautiful home, please be respectful of our house and property. The Yurt is located in the midst of trees, so please respect the birds live. We would appreciate no loud music, no parties and no smoking inside the Flat. No more than two outside visitors without letting us know in advance. Separate entry and parking to guarantee your privacy and you won't disturb our family! Please leave the site as clean as you have found it. Empty your bins, clean the barbecue and empty the composting toilet at a location that we would indicate. We are a French-Australian couple who have made the beautiful Central Coast our home for the last 28 years. Our three children have left home (mostly) and we have decided to share our nurturing environment with guests. If you are looking for a beautiful secluded bush retreat minutes by car from the most stunning beaches on the Central Coast, we would be delighted to have you stay with us. We enjoy meeting new people and are happy to guide you in your discovery of the Central Coast or to leave you in complete privacy. We are a French-Australian couple who have made the beautiful Central Coast our home for the last 29 years. Our three children have left home and we decided to share our nurturing environment with guests. We really enjoy meeting new people and are happy to guide you in your discovery of the Central Coast or to leave you in complete privacy. If you are looking for a beautiful secluded bush retreat minutes away from the most stunning beaches on the Central Coast, we would be delighted to have you stay with us. Unique setting, very comfortable room in the middle of a forest with views on stunning trees. You are being awaken by the noise of birds and the Australian bush. Very tidy, friendly owners, peaceful environment. Loved hearing the birds. I took my 6 years old daughter for a couple days of daddy daughter time. She was very excited by the cabin / tree house feel of the yurt and she wasn’t disappointed, we had a great time. Right mix of “bush walks / wildlife spotting” and awesome coffee 300m away. The Yurt is a bit special and very much back to nature which is what we (I) wanted. All the positives of camping without any of the inconvenients and the option to close all the doors and feel in a normal cabin. 10/10 for the hosts as well who were super friendly and helpful (so much so that we re due for a coffee on our next visit to the central coast). Great rustic place that makes you feel that you’re completely away from it all, even though it’s a short drive to Terrigal (or a short walk to a cool cafe & restaurant). Hosts are very cool and we’d return just to continue our chat. We’ll be back! the yurt was an awesome weekend away so close to such nice little cafes and beaches even when it felt like you had the privacy of being out in the bush. we loved the setting and the lay out it was so comfortable for our stay. the nature shower is a must!!!! Totally appreciated the beauty, privacy, and natural setting of this property, and the outdoor living. Yurt itself very snug and comfortable.Excellent location for walking in nature or to find great coffee, food, or shopping. Also very good bus connections. Highly recommend for peaceful natural getaway.